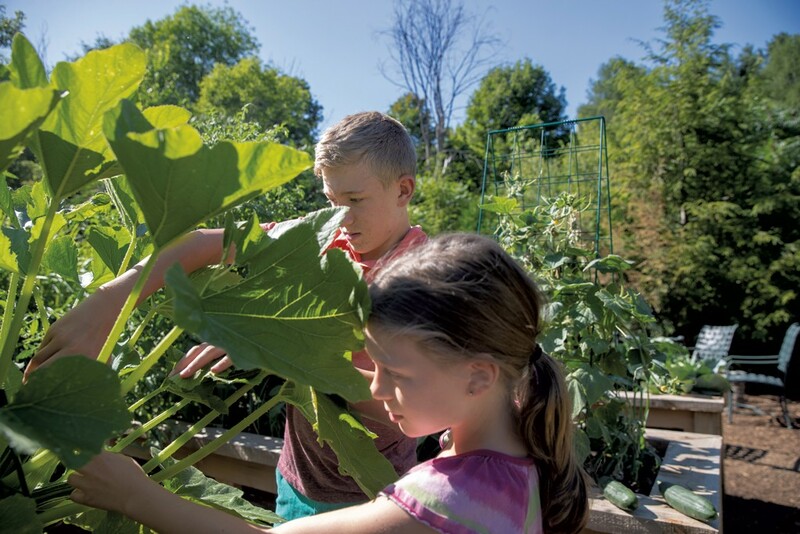 Habitat: Gardeners' Paradise | Habitat | Kids VT - small people, big ideas! Stacy Fraser and Nate Carr's Charlotte home. Good parents, Dr. Jonas Salk famously said, give their children roots and wings. Stacy Fraser and Nate Carr can most definitely check the first box. They have surrounded their Charlotte home — and their children, 12-year-old Sawyer and 8-year-old Mavis — with plants. 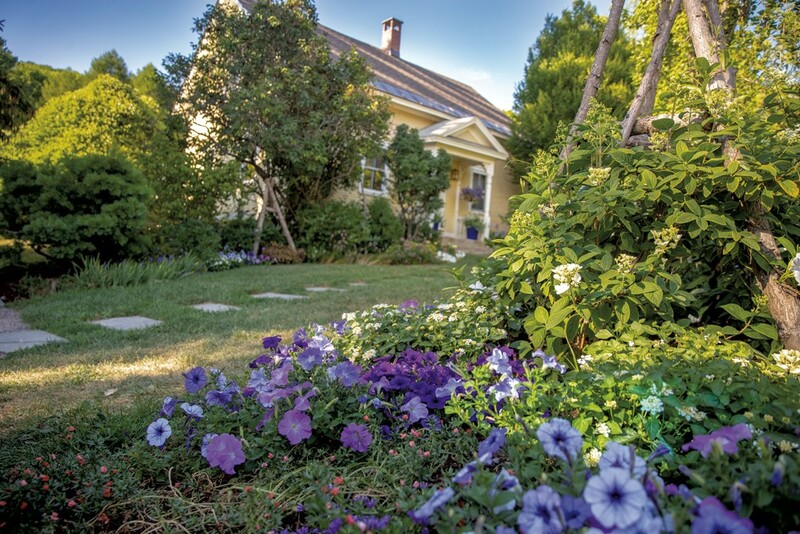 Flowers and bushes grace their front yard and wind around their 19th-century, yellow clapboard house to a backyard sanctuary. Trees, shrubs, annuals, perennials, edibles and ornamentals — hundreds of varieties in all — grow there. Sawyer and Mavis tend their new vegetable beds. Slabs of Vermont stone form paths and patios. Chairs and tables await morning coffee or a fat afternoon novel. "We definitely think of it as — it's a trendy term — but different outdoor rooms or outdoor spaces," Stacy said, "like the fairy garden space, the relaxed reading patio, the fire pit, the veggies, the dining patio." When the couple bought the house 18 years ago, overgrown weeds, invasive sumac and a broken fence covered the 2/3-acre lot. They kept the peony and lilac bushes framing the front door, and the day lilies on the property's edges, pulled out everything else, and the transformation began. Stacy and Mavis inspect cabbage. "We really started as collectors, like being interested in the diversity of plants and ... we were intrigued by the novelty of variety," Nate said. 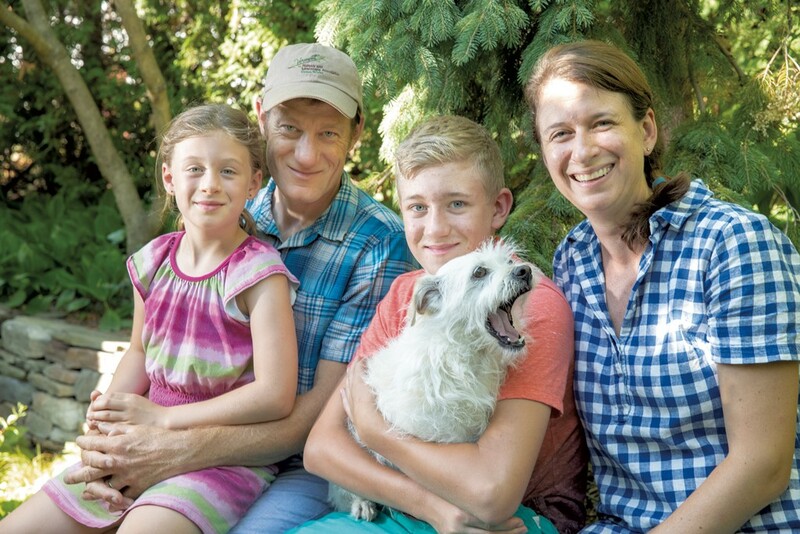 He and Stacy, who own landscape-construction and gardening company Church Hill Landscapes, have college degrees in sustainable agriculture, and Nate is a Vermont-certified horticulturalist. They started their ornamental gardens with an oakleaf hydrangea surrounded by shade-garden perennials. They continued adding beds and uncommon plants, including a weeping larch, dwarf hemlock and golden dawn redwood, now big enough to climb. 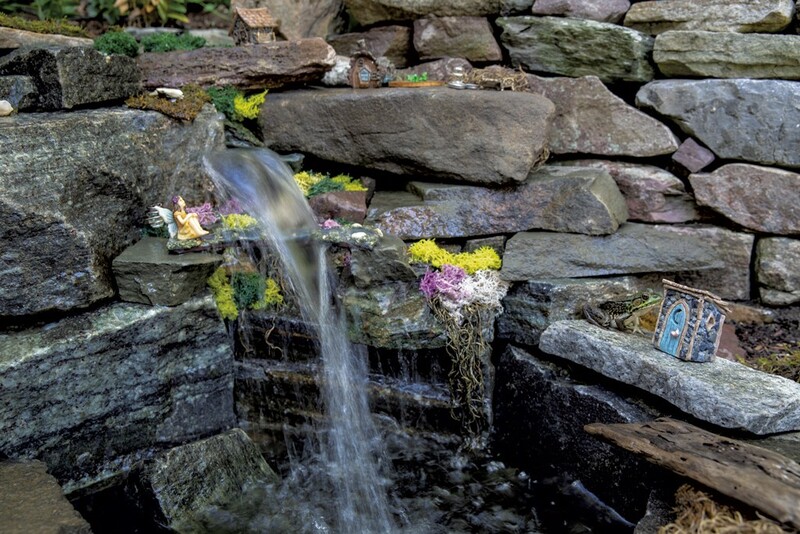 A waterfall graces the fairy garden Sawyer built for Mavis. The flowers were a lot of work, so when the kids were small, the couple incorporated more shrubbery, "plants that take up a lot of space and not a lot of attention," Nate said. Their most recent plantings are designed to attract birds and pollinators: bees, wasps and butterflies. They chose relatively low-maintenance perennials, including early salvias, perennial geraniums, echinops, asters and monarda, which has attracted a pair of ruby-throated hummingbirds, to line the edge of the backyard. They planted the flowers close together to help suppress weeds. Rather than cutting back each plant individually, Nate mows them down in the spring and leaves the debris to serve as mulch, a method Stacy calls "grow and mow." 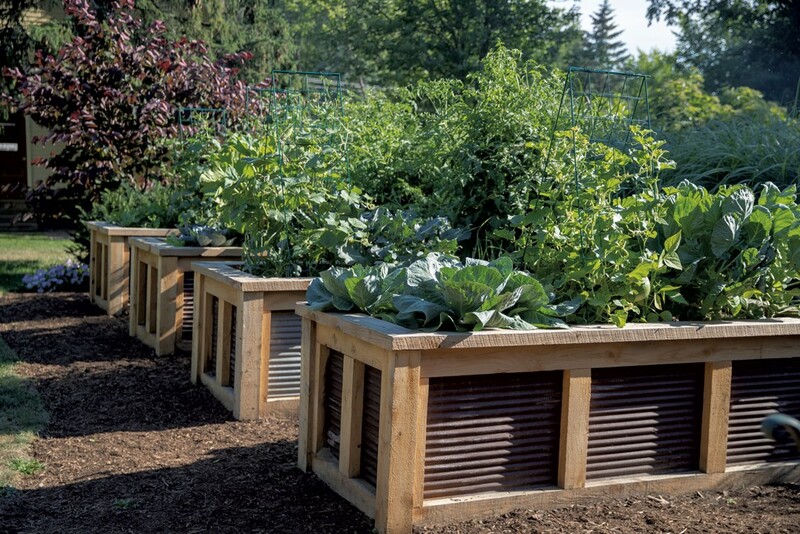 Lush, organic vegetables pack four raised beds. 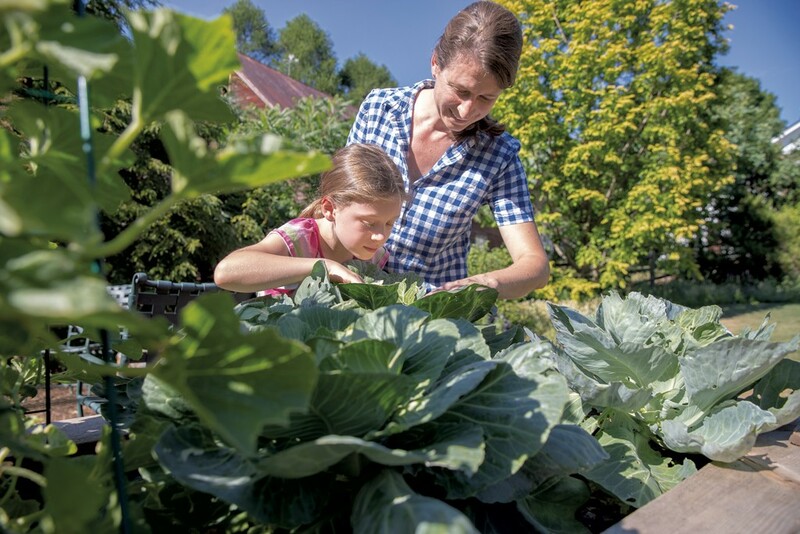 New this year are four raised organic vegetable beds that provide summer meals — and an education. The kids got to pick which vegetables to plant. "Actually their list was twice as long as we could realistically plant," Stacy said. Asked to name her favorite vegetable, Mavis answered, "I like all of them." Sawyer, who dislikes only parsley and cilantro, examined a small green pepper they grew. A mushy hole had formed near the bottom. "When the plant is creating the fruit or vegetable and it doesn't get enough water, it has blossom-end rot," he explained. "And we farmers don't like that!" Mavis added. "This [pepper] was a male, and it's good for cooking," Sawyer continued. He knew the pepper was the product of a male blossom because it had three bumps on the bottom. "Female peppers have four bumps on the bottom," he explained. "Those are really sweet, and they are good for normal eating." 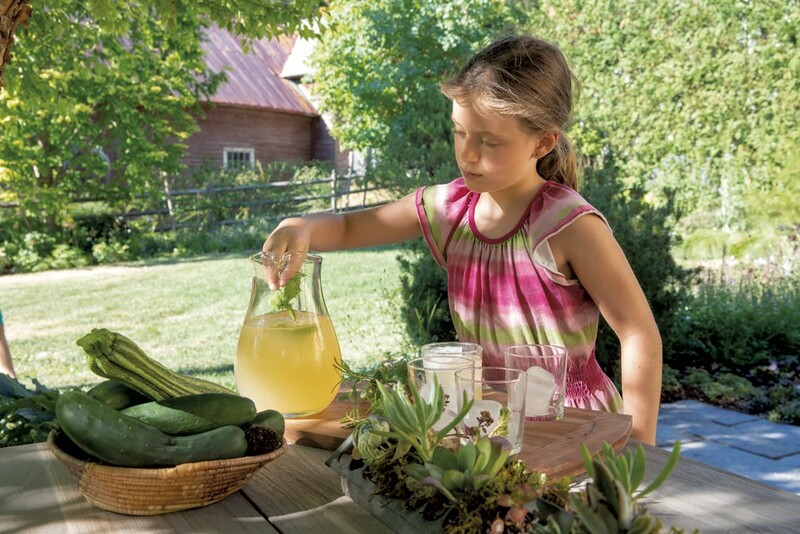 Nate and Stacy want their kids to know how to grow food, to understand the challenges (they spend a lot of time squishing cucumber beetles, cabbage worms and squash bugs), to recognize what a fresh vegetable tastes like and to become confident cooks, said Stacy, who was test kitchen manager at EatingWell for 13 years. "We're teaching them what we know." Here are a few of Stacy and Nate's favorite easy-to-grow-and-maintain perennials that thrive in part or full sun in Vermont.